In some cultures, apricots are known as the "nectar of the Gods," so go ahead and enjoy this heavenly flavored coffee that features the creamy, fruity flavors of apricots. The Apricot Cream flavored coffee is made with 100% authentic Arabica beans, and with only 2 calories in each cup of this gourmet flavored coffee, your taste buds will want more and more of this deliciously smooth and creamy apricot treat. Heat-sealed valve bags will protect and ensure the freshest coffee possible, which is why we roast and ship on the same day. 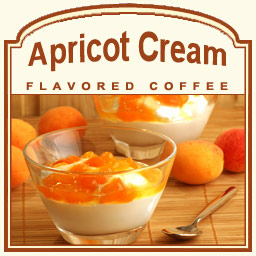 For a creamy, sun-kissed treat, look no further than this Apricot Cream flavored coffee.